Update: Wildland Fire crews made good progress in steep terrain fire is contained at this point. 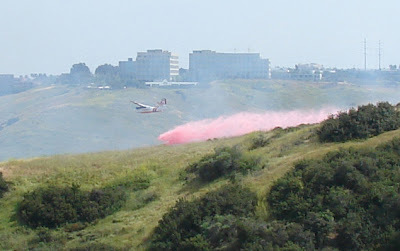 IA: Fire on the 3900 block of Sorrento Valley Blvd. in Los Peñasquitos Canyon Preserve . Evacuations: Precautionary evacuations were announced for 250 homes in the area of Ocean Air Drive including the cul-de-sacs, Corte Jardin Del Mar, Corte Mar Asombrosa and Terraza Mar Mar Marvelosa. People in other nearby homes had been asked to prepare to leave. But the evacuation requests were dropped shortly before 4:00 p.m. as . News: The wild land fire has spread to at least 80 acres according to Mayor Jerry Sanders during a news conference carried live on FOX6. The fire was 90% contained at 4:00 and expected to be fully contained by about 6:00, according to the mayor.